Universal stand assist adds support handles to furniture, helping you safely sit or stand with less strain. 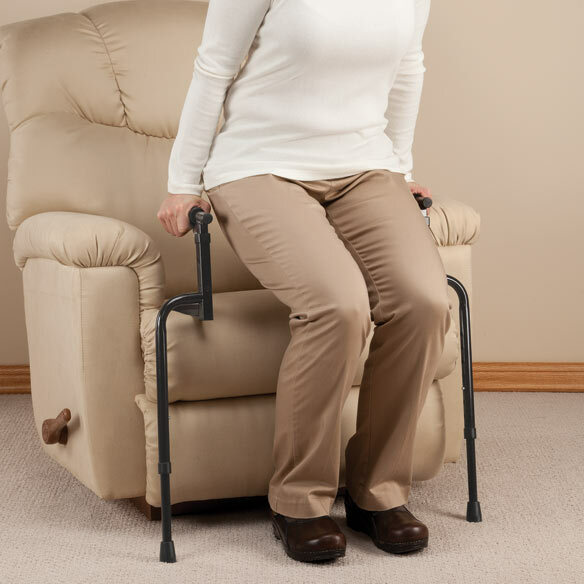 Stand assist's universal design fits under or over cushions on most couches, chairs and recliners. All dimensions are fully adjustable for maximum support and versatility. Seat assist's handle height adjusts 22”–32”. Width between handles adjusts 19”–26”. I bought a second one within one week! I have no knees now making standing extremely difficult. I can now stand independently. It worked so well I ordered the second one the following week. Now I have one in the living room and the den. My therapists have all asked for copies of this and cannot believe how easy it is for me to stand. I have recommended this product to many folks. This made my day. Now I am able to get up off the couch or recliner by myself. This has given me a great more freedom, and can now stay by myself. I am also able to move it from one room to another as there are no doors to pass through. I have liked it so well (have no knees) that I just ordered a second one. This device enables the user to easily stand up from sitting on a chair, even a recliner. It is extremely adjustable for fitting it to the chair, Very sturdy, and extremely versatile fitting many different chairs. In fact, if it was one to two inches wider it would fit all recliners. However, use of an ottoman enables ample reclining. Much lower cost than a lift chair. Because my husband has a very hard time getting up from his chair. This should help. I need this for my lift chair, it dumped me on the floor because I have nothing to hold on to when it lift me to a standing position. I do hope it works on my life chair. Someone asked me to order this. My husband has Parkinsons Disease and am hoping this will help him in getting out of chair. Can be used with any chair. I like the design and the adjustability. Needed it; couldn't find it locally. 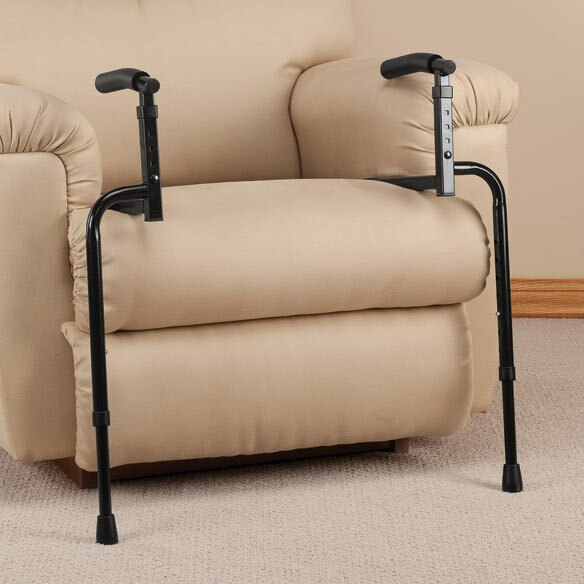 Purchased for my elderly mom who has trouble getting up off the couch. Mom is having trouble getting out of her recliner. She has lower back issues and diabetic issues in her legs. I am hoping it fits my recliner, and will assist me in rising up from it. For my Mother...who has become disable...and to help her get up out of her chair. after sitting without my assistance. I still have to receive the support handle and use it, but it appears to definitely satisfy a need I have. my husband is 300 lbs. he needs assistance getting out or his favorite chair. To Make it Easier for Mom to Stand Up or Sit Down From Her Chair! Just what we need! Fair price also. Excellent reviews! It was recommended by a nurse. My wife needs it to get up from the couch. Aids my husband's rising from his chair. I have purchased one and I really like it. It helps me get out of a chair. I need another one for my husband. I need help getting up from my chair. Because my 100 year old husband has a hard time getting out of his recliner and I am sure this will help him. I have trouble getting out of chairs. I thought it would be easier for me to get out of the various chairs in my house if I had this support. If you use this product on a rocker recliner can you still recline the chair or even use the rocking motion? BEST ANSWER: Thank you for your question. When using the Universal Stand Assist on a recliner chair, the chair will not be able to be reclined. We hope this information will be of help to you. can it be used on a toilet? BEST ANSWER: It isn't designed to be used on a toilet because there are no attachments to a toilet. It would probably have to rest in back of the toilet seat or toilet cover without being secured. However, when used on a chair, it is effective in assisting the user to rise up from the seated position. Thank you for your question. The Universal Stand Assist is designed to fit under or over cushions on most couches, chairs and recliners. We hope this information will be of help to you. can this item be returned if it does not work for my grandparent? BEST ANSWER: Thank you for your question. Yes. You have 45 days form the ship date to make a return. We hope this information will be of help to you. can this be used over the toilet? BEST ANSWER: I got one for my elderly parents to use in their recliner. I just don't think the square bar that sets around their seating area would be safe around a toilet. I use a bathroom one that has 4 sturdy legs. This works in their chair though. Dad likes when I turn the handles out instead of in. I wouldn't think so. The bar along the back might interfere with safe placement. They make specific supports for /off toilet. One even comes with the whole seat and removable bucket which can be used as a bedside commode or a sit/stand support for toilet. No, it cannot be used over the toilet. The chair cushion is needed to hold the brace down and in place. Will the legs adjust high enough for sitting on the side of the bed? My bedfast husband needs something to help him feel steady while briefly sitting on the side of the bed.